This plant, which is of the ginger family, received its name because of the Saffron yellow color of its roots and is cultivated in China, Indonesia, on the Indian subcontinent and the tropics of South America. The Rhizome is used either as fresh root or air-dried. The latter is pounded in a mortar to give an intensely yellow powder. The Curcuminoids, which are used as spice and dye in the food industry are the main component of the Kurkumas. In addition, the root of turmeric contains essential oils, but also minerals and trace elements, such as iron, magnesium, copper, manganese, vitamin B6, calcium, chromium, selenium, zinc for example – more than 90 active ingredients were able to be identified by researchers so far. Studies show that Curcumin is much more than only spice and dye for foods. It inhibits cancer and inflammation, reliefs pain, acts as an antioxidant and protects the nerves. 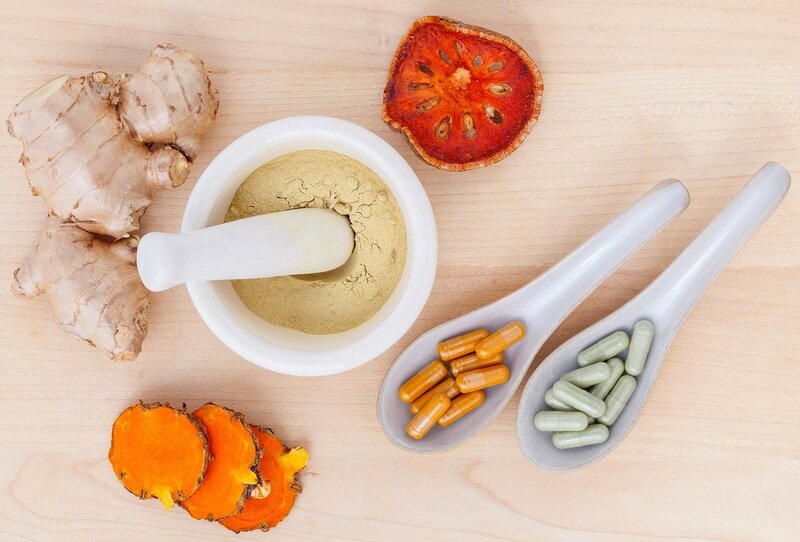 In traditional Chinese medicine, turmeric has been used as a panacea. The plant equally produces this medically usable Curcumin as protection against own diseases and infections. When the Curcumin is heated, the human body is able to better absorb the active ingredients. Rheumatism: Since rheumatoid arthritis is an inflammatory disease, anti-inflammatory substances of Curcumin work excellently. Because of this, turmeric is used as an addition to the allopathic medicines. The active ingredient prevents the acute relapses, takes a bit of the seriousness of the chronic course and simultaneously relieves the pain in rheumatism and arthritis. Curcumin protects the cartilage cells and thereby decelerates the course of the disease. In addition, the active ingredients in turmeric ensure that there is a better circulation in the mucous membrane of the joints. When Curcumin is taken, pain relievers can often be reduced, inflammation and swelling as well. In addition: turmeric is without the usual side effects that other medication usually come with. Cancer: Turmeric as a medicinal plant helps prevent and treat cancer: this was already explored in more than 1,000 clinical trials. It inhibits, for example, the emergence and spread of metastases and activates the body’s genes, which damage the cancer cells. The supportive therapy effect of Curcumin was demonstrated especially for skin, colon, breast, lung, prostate and uterine cancer. The active ingredient is compatible with chemotherapy drugs and other medications used to fight cancer. Alzheimer’s disease and dementia: Free Curcumin is able to overcome the barrier between blood and brain. Therefore, it helps against diseases of the brain, such as Alzheimer’s, dementia and Multiple sclerosis. Although it is still not conclusively established as to how Alzheimer can arise at all, Curcumin supports the preservation of myelin layers with its antioxidant properties, contains the inflammation in these areas and provides for an increased cell oxidation. Digestion: Curcumin stimulates both the production of stomach acid and bile acid. So carbohydrates and fats are better digested, reducing bloating and constipation. Because Curcumin effectively supports the digestion of fat, it is used on adipositic patients. In addition, Curcumin not only helps you lose weight, but also better distributes the water in the cells so that retention can be avoided. Pain and inflammation: Curcumin and essential oils contained in turmeric have anti-inflammatory and pain-relieving effect and compare according to studies with the effect of paracetamol, hydrocortisone, and other drugs, but without their harmful side effects. Heart disease: Many heart diseases can be triggered by a bad ratio of “good” HDL to “bad” LDL cholesterol, which leads to calcification of the arteries. Although a part of cholesterol is absorbed with food, a big part is manufactured in the liver itself. The consumption of Curcumin supports the regulation of cholesterol levels in favor of HDL cholesterol. Respiratory tract and allergies: Curcumin contains polyphenols, which could represent an alternative to corticosteroid treatment for allergic asthma and chronic obstructive pulmonary disease. The agents bind nitrogen monoxide and catch free radicals, so that more oxygen gets in to the lungs of patients. At the same time, Curcumin promotes oxidation and stimulates cellular respiration.